Religions are different. But are they "ultimately the same"? Are the differences superficial, or do they go "all the way down"? Lake Chalice began exploring that question last week. Today we take a moment to marvel at the fact that we can even ask that question. For most of human history, most people assumed that their religion was the right one and all others were wrong. That was a very clear -- and "all the way down" -- difference. A significant event in the shift in our awareness of religions came in 1893. The World's Parliament of Religions in Chicago that year set in motion a profound reshaping of interreligious understanding. It was the first formal gathering of representatives of Eastern and Western spiritual traditions, and it gave birth to formal interreligious dialog worldwide. While there were absences – there were no Native American religious figures, no Sikhs, and a number of other indigenous and earth-centered religious traditions were absent – the conference was stunning in its time for its inclusivity. Mary Baker Eddy was there, representing the new Christian Science. It was the first time that Americans heard about or from the Bahai Faith. Anagarika Dharmapala was there preaching and representing Theravada Buddhism. The Jain preacher Virchand Gandhi was there. Japanese Zen master Shaku Soen gave Americans their first exposure to Zen. 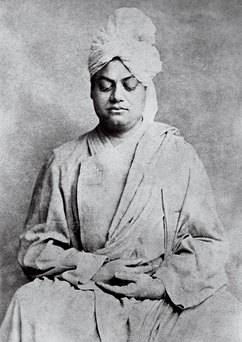 The eloquence of Swami Vivekananda on the eternal values of India brought about for the first time among westerners, a feeling that eastern religions were not merely exotic oddities but might actually have something important to teach the west. Lake Chalice cannot resist mentioning the significant role played by Unitarians and Universalists at the 1893 World's Parliament of Relgion. The Unitarian minister Jenkin Lloyd-Jones was one of the 16 on the planning committee that toiled for two years to make the event happen. At the Parliament, Unitarian and Universalist speakers brought, and embodied, new ideas about gender equality in religion. 1893 came during a chapter of Unitarian history known as "The Iowa Sisterhood" – a period in which many Unitarian women ministers thrived in pulpits dotting the Midwest frontier – pulpits which male ministers had refused or abandoned. A number of these Unitarian women ministers spoke at the World Parliament of Religions, including Rev. Marion Murdoch, and Rev. Ida Hultin. Unitarian lay activists and scholars Julia Ward Howe and Eliza Sunderland also gave prominent and acclaimed addresses at the Parliament. Universalist minister Augusta Jane Chapin chaired the Parliament’s Woman’s Committee, addressed the opening and closing sessions and was the only woman to preside over a session. “Sectarianism, bigotry, and its horrible descendant, fanaticism, have long possessed this beautiful Earth. They have filled the earth with violence, drenched it often with human blood, destroyed civilization, and sent whole nations to despair. Had it not been for these horrible demons, human society would be far more advanced than it is now." Participants at the parliament were so moved, so deeply influenced by who they met and saw and heard there, that the modern movement for tolerance and interfaith respect in America – a movement that Unitarians would so take to heart that it is central to who we are today – are direct results of that 1893 conference. We are what we are now because of the Parliament of World Religions 120 years ago. This is part 3 of 5 of "Religions: Same and Different"
Previous: Part 2: "Stages of Faith"